The Spanish Expedition to Borneo, also known locally as the Castilian War, (Malay: Perang Kastila; Jawi: ڤراڠ كستيلا, Spanish: Expedición española a Borneo) was a military conflict between Brunei and Spain in 1578. Since the middle of the 16th century, Europeans were eager to gain a foothold in South East Asia because of the spice trade. Spain also wanted to spread Christianity, the largest faith in Europe. Since the Fall of Constantinople in 1453, the land routes from the Eastern Mediterranean to South East Asia through Central Asia and the Middle East, were controlled by the Ottomans, Persians, Arabs, and Indian Muslims. As a result, the Portuguese and later the Spanish, tried to find an alternative route by sea to South East Asia, so they could trade in spices and other products with the Malays. At the time, Brunei Darussalam was a loose empire extending from Borneo Island, also claiming but not rarely controlling parts of the Philippines. It was during the reign of Sultan Saiful Rijal when the Castilian War broke out. He faced two main problems which was that the Spanish wanted to spread Christianity and invade the Philippines. From their ports in Mexico, the Spanish sent several expeditions to the Philippines and in 1565 under Miguel Lopez de Legazpi, settled in Cebu. For a time Cebu became the capital of the archipelago and the main trading post. It was also the first city for spreading Christianity in the islands. Because of this, Spain's aspirations came to clash with those of Brunei. Between 1485 and 1521, the Sultanate of Brunei led by Sultan Bolkiah had established the state of Kota Serudong (Otherwise known as the Kingdom of Maynila) as a Bruneian puppet state opposed to the local Kingdom of Tondo. Islam was further strengthened by the arrival to the Philippines of traders and proselytisers from present-day Malaysia and Indonesia. The multiple states that existed in the Philippines simplified Spanish colonisation. In 1571 Spanish Miguel Lopez de Legazpi attacked and Christianized Islamic Manila, which was made the capital of the Philippine Islands, also becoming a hub for trade and evangelisation. The Visayans, (people from the Kedatuan of Madja-as and Rajahnate of Cebu) which before the Spanish came, had waged war against the Sultanate of Sulu and the Kingdom of Maynila, now became allies of the Spaniards against the Sultanate of Brunei. The time the Castilian War broke out was a time of religious fervor in Europe and many parts of the world, when a single state religion was followed. In Spain, the state religion was Roman Catholicism obliging followers of other faiths such as Jews and Muslims to convert to this religion. The Spanish had recently finished a 700-year-old war to reconquer and re-Christianize Spain, which had been invaded by the Muslims under the Umayyad Caliphate since the 8th century AD. The long process of reconquest, sometimes through treaties, mostly through war, is known as the Reconquista. The hatred of Spaniards against the Muslims that once invaded Spain fuelled the Castilian War. This war also started the Spanish–Moro Wars in the Philippines against the Sultanate of Sulu and Sultanate of Maguindanao. In 1576, the Spanish Governor in Manila, had arrived from Mexico and he was Francisco de Sande. He sent an official mission to neighboring Brunei to meet Sultan Saiful Rijal. He explained to the Sultan that they wanted to have good relations with Brunei and also asked for permission to spread Christianity in Brunei (Roman Catholicism in Brunei was a legacy brought by Spaniards). At the same time, he demanded an end to Brunei proselytism of Islam in the Philippines. Sultan Saiful Rijal would not agree to these terms and also expressed his opposition to the evangelisation of the Philippines, which he deemed part of Dar al-Islam. In reality, De Sande regarded Brunei as a threat to the Spanish presence in the region, claiming that "the Moros from Borneo preach the doctrine of Mahoma, converting all the Moros of the islands". Spain declared war in 1578, attacking and capturing Brunei’s capital at the time, Kota Batu. This was achieved as a result in part of the assistance rendered to them by two noblemen, Pengiran Seri Lela and Pengiran Seri Ratna. The former had travelled to Manila to offer Brunei as a tributary of Spain for help to recover the throne usurped by his brother, Saiful Rijal. The Spanish agreed that if they succeeded in conquering Brunei, Pengiran Seri Lela would indeed become the Sultan, while Pengiran Seri Ratna would be the new Bendahara. In March 1578, the Spanish fleet, led by De Sande himself, acting as Capitán General, started their journey towards Brunei. The expedition consisted of 400 Spaniards, 1,500 Filipino natives and 300 Borneans. The campaign was one of many, which also included action in Mindanao and Sulu. The Spanish succeeded in invading the capital on 16 April 1578, with the help of Pengiran Seri Lela and Pengiran Seri Ratna. The Sultan Saiful Rijal and Paduka Seri Begawan Sultan Abdul Kahar were forced to flee to Meragang then to Jerudong. In Jerudong, they made plans to chase the conquering army away from Brunei. The Spanish suffered heavy losses due to a cholera or dysentery outbreak. They were so weakened by the illness that they decided to abandon Brunei to return to Manila on 26 June 1578, after just 72 days. Before doing so, they burned the mosque, a high structure with a five-tier roof. Pengiran Seri Lela died in August–September 1578, probably from the same illness that had afflicted his Spanish allies, although there was suspicion he could have been poisoned by the ruling Sultan. Seri Lela's daughter, a princess of Brunei, left with the Spanish and went on to marry a Christian Tagalog, named Agustín de Legazpi of Tondo and they had children in the Philippines. The local Brunei accounts differ greatly from the generally accepted view of events. The Castilian War entering the national conscience as a heroic episode, with the Spaniards being driven out by Bendahara Sakam, supposedly a brother of the ruling Sultan, and a thousand native warriors. This version, nevertheless, is disputed by most historians and considered a folk-hero recollection, probably created decades or centuries after. Notwithstanding their retreat from Brunei, Spain managed to keep Brunei from regaining a foothold in Luzon. Aside this, a few years later, they were ready to trade again with the Sultanate, as evidenced by a letter from Don Francisco de Tello de Guzmán, Governor General of Manila, dated 1599 asking for a return of normal relationship. The war between the Spanish and Moros in Mindanao continued, after Spain abandoned Brunei. Following the war, the Sultanate of Brunei would cease to be an empire at sea, eventually turning into a city-state, letting aside any previous territorial expansion policies, even selling part of their own territory until becoming one of the smallest nations in the world today. This new policy of sustained caution in their dealings with European powers allowed it to survive and become the oldest continuous Islamic political state. ↑ Ollé, Manel (2000). La invencion de China / The invention of China: Percepciones Y Estrategias Filipinas Respecto a China Durante El Siglo XVI / Philippine Perceptions and Strategies Towards China During the Sixteenth Century. Otto Harrassowitz Verlag. p. 94. ISBN 3447043369. Retrieved 29 December 2015. ↑ "Pusat Sejarah Brunei" (in Malay). 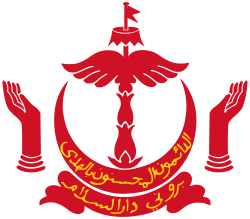 Government of Brunei Darussalam. Archived from the original on 15 April 2015. Retrieved 4 March 2010. ↑ "Letter from Francisco de Sande to Felipe II, 1578". Retrieved 17 October 2009. ↑ Donoso, Isaac (Autumn 2014). "Manila y la empresa imperial del Sultanato de Brunei en el siglo XVI". Revista Filipina, Segunda Etapa. Revista semestral de lengua y literatura hispanofilipina. 2 (1): 23. Retrieved 29 December 2015.